Joe Morgan Senior's web site has been added to our list of Members with Home Pages. Check out Joe's site at http://digital.net/~jomosr/. Joe is a retired Kennedy Space Center Fire Inspector. He has a variety of links for your surfing pleasure such as Matthew Gray's List of Cool Stuff on the Web. We are making progress at adding members with home pages but it is painfully slow so perhaps a little discussion on my part might help. First let's clear up a little confusion. Many times the terms home page and web site are used interchangeably. A web site is a presence on the World Wide Web and may consist of one or more pages. A home page is simply the main page or first page you go to when you type in a basic URL (Uniform Resource Location) address or click on a basic web link. So if your web site only has one page it is also your home page. As an example, my personal web site is at http://www5.palmnet.net/~cpotsic. That URL address also takes you to my home page (Curt & Milada Potsic's Home Page). A home page file name is always index.html or index.htm. You could go to http://www5.palmnet.net/~cpotsic/index.html and arrive at the same page. All other pages on a web site can be called anything you like as they are either linked to from your home page, another page on your web site, or an individual must know the complete URL address to get to it. For example, the third page on my personal web site (The Potsic Family Album) is at http://www5.palmnet.net/~cpotsic/index3.html. From that I have a link to a sub page (The Potsic Pool Page) but you could go there direct by typing http://www5.palmnet.net/~cpotsic/pool3a.html into your browser location window. Now this raises another possibility. Suppose you are working on a web page but it is not yet ready for the world to see. However, you would like to see what it looks like on the web while you work out a few bugs. You can place that page up on the web with a URL address known only to you. Nobody would be the wiser. Most problems with web page creation can usually be worked out by opening the page in your browser with the supporting files on your hard drive. Some however, like verifying web links in the Java News Scroller on our SCPCUG web site, require the page actually be placed on the web. Before I go too far let's get back to a basic question. Why do I need a home page? That's the question I asked when I first thought about creating a home page. Two words answer that, "recognition" and "communication". Where else can you express your views on any subject of your choosing or show off your family to anyone in the world that is on the Internet? In essence you can make your mark on the world saying "Here I am!". Granted, it's not like planting a flag on the moon but what the heck. Where else can you reach so many for so cheap a price with such little effort? Is it any wonder Internet stocks are skyrocketing? If you don't feel you need to let the world know, then just think of it on the scale of family and friends. Put that new picture of your grandchild up on your home page and all your online relatives can instantly see how he/she has grown. It is also a great way to make new friends. I have met many people and established friendships simply by them visiting my home page and signing the guest book. I started surfing the Internet on April 28, 1996. 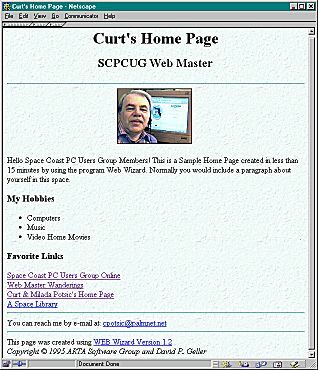 By mid June 1996 I had my first attempt at a home page online. That first attempt was a simple web page done in 15 minutes with next to no effort. I hope that this will encourage all of you to create a home page. Download free a program called Web Wizard at http://www.halcyon.com/artamedia/webwizard/. For Windows 95 download the 32-bit version. The downloaded file appears on your hard drive as "web32bit.exe" and is a very small 223 KB self-extracting ZIP file. When run it creates the 453 KB file "Webwiz32.exe." Webwiz32.exe is exactly what the name implies. When run a wizard walks you through the task of creating a home page. This program is just a small executable file and does not install any files to your hard drive. It asks questions and you fill in the blanks. First you specify a title and subheading. Second you are given the option of a colored background or using a small gif or jpg for a tiled background. Next is an option to include a photo or graphic on the page. The program is set up to default to gif format which is usually a graphic. However you can use a photo in jpg format if you type in the path. A paragraph about yourself or subject of your choosing is the next option. If you have need to include a bullet list (like your hobbies) that is covered also. The wizard makes it easy for you to even rearrange the order of the list. No home page would be complete without a list of your favorite web links so the wizard will help you there. And to complete your home page you can add your e-mail address link so people can send comments about the great page you created. The wizard is so smart that upon saving your home page he will even copy your image files to the same directory as your web page, making it easy for upload of everything to the web server. If you do not type in a file name when saving your creation but instead click the "select" button, the wizard will save it as "homepage.htm". When uploaded to your Internet Service Provider's (ISP's) web server the file name must be "index.html" or "index.htm" depending upon the type of server your ISP uses. Check with your ISP. Palmnet prefers "index.html". Do you want to take a quick look at the source code behind what you have created? Open your html page (created with Web wizard) into your web browser's window. In Netscape Communicator 4.5 on the topleft side select "View" and from the resulting dropdown menu select "Page Source". Netscape 3.0 called it "Document Source". Internet Explorer works in a similar way. Look for the word "Source". When the source code page pops up you will see a few suggestions from the Web Wizard in a form that is the equivalent of a rem statement on how you can change your source code. To modify the source code drop your html page into Wordpad (or Notepad) and edit as any other text document. When finished be sure to save it as a text document but with the extension html or htm. Do not use a fancier word processor (such as that in Microsoft Works) as they add invisible formatting characters when the file is saved. Those formatting characters interfere with the HTML (Hyper Text Markup Language) source code. Keep it simple by using Wordpad. Okay you now have your home page created. You can view it on your hard drive by simply opening (or dropping depending on the version of your browser) the html page into your Netscape or Internet Explorer browser window. But how do you get it up on the Internet? One option is to do what I did the first time. Put it on a floppy and handcarry it down to your ISP (if you have a local ISP) and let them put it on their server. While there have them explain how their system works so you have a better understanding. A visit to your ISP might be fine for a one-time shot but a home page is not something that you put up once and then forget. You have now created a "living" document that will change and evolve with time. To be able to grow and change your home page you need a File Transfer Protocol (FTP) program. A FTP program will upload your home page files to your ISP's server. Your ISP can tell you the exact location and file path you will need for upload of your files to their server. Access to this location will be password protected so only you and no one else can modify your files. The program I first used was called WS_FTP95LE. It has changed and been upgraded since I first downloaded it in 1996. They now call it WS_FTP LE4.6. It is free for non-commercial use and available at http://www.ipswitch.com/cgi/download_eval.pl?product=WL-1000. One thing to keep in mind when uploading files to your ISP is to upload all of the files. A common mistake many novices make is to upload only the html page and not the accompanying jpg photos or gif graphics. The html page only references the graphics and does not contain them. If viewed on your hard drive the graphic or photo appears properly within your home page because all the files are on your hard drive. But once on the web, if that graphic or photo file is missing from the ISP's server, the server can't find it and your html page will appear with the photo or graphic shown as a broken icon. You will also see this broken icon if for some reason the file name you referenced when creating the html page is different from the actual name of the file. Also make sure the names and extensions on your uploaded files and any references to supporting files in your html page are in lowercase. Some servers prefer lowercase. I think that is probably enough information for you to digest for now. I have given you the basic info you need for creating a simple home page and getting it put on the web. Next time we will discuss learning HTML so that you can expand and modify that home page.